I totally got caught up in Patty Bennet's watercolor roses technique this weekend. I learned this technique from watching Patty Bennet's tutorial over at Patty's Stampin' Spot. s time to begin to watercolor in your roses! Using your average spray bottle, spritz water onto your cs, making sure that it's plenty wet -- I had to go heavier than I thought! I put a couple of drops of ink onto a plastic Cool Whip lid to start with. I took my aquapainter and picked up a drop of ink and placed it inside the lines of the petal that I wanted to color. As I dropped it down inside the embossed lines of the petal, I squeezed off a drop of water. As you go, you can pretty much fill up a section. When you change colors, make sure to clean off the tip of your aquapainter! 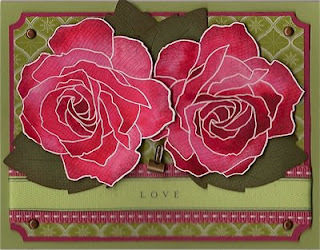 On the above card, I used Pretty in Pink, Rose Red and a tiny bit of Riding Hood Red. It will take your images about 30 minutes to dry. I stood them up on their ends so that the excess water/ink would pool at the bottom of the petals, giving them a more natural look. TIP: if you've got too much water/ink, you can soak it up by drying the tip of your aquapainter and letting it soak up the excess. When your roses are dry, cut them out and they're ready to use on your next project!